Two years in August, we contacted a local draftsman to talk about drawing up plans for our house extension. TWO YEARS AGO. Ever heard this old gem – that renovations always take twice as long and cost twice as much as you planned for? Yeah, so far, the first part is true. We’re yet to find out about the other part because, well, we’re only a few weeks in and while the bills have been frequent and hefty, we really won’t know final costs for a while! We were originally told if all went smoothly we could have our plans drawn up, submitted and approved through council in a maximum of 12 weeks. Hahahahahahahaha. No. Not even close. It took us a year to do plans, soooo many months in council, stuff-ups and surprises and life stuff too. And so two years after showing our little sketches to the draftsman, here we are, seeing them come to life. It’s SO exciting – we might even be able to host Christmas here this year (I’ve had to swap with my sisters for the past three years!) But I shouldn’t get ahead of myself – read those first few sentences again! 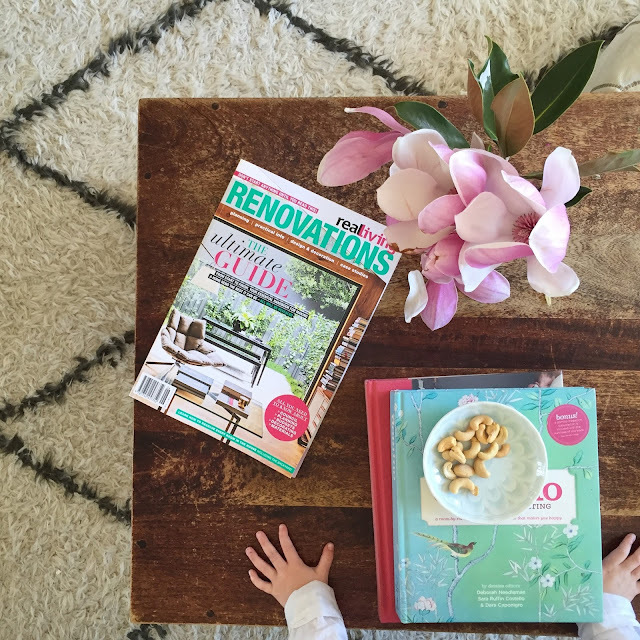 Part way through our council-approval-stage delay, Real Living magazine asked me to write an entire magazine on renovating. I’d been planning to contact them about writing again – it’d been a while since I’d done any kind of work and I was feeling like the time was right. In the end, they got me first and I agreed, although about two weeks in I started to regret it as it was a HUGE job – and not exactly easing back into work, which I’d envisioned I’d be doing! But once I got past the “OMG where do I start? !” I started to enjoy it. I’ve always been annoyed by magazine articles on renovation or those bathroom and kitchen guides – I never feel as though they cover the right things. It’s all so general or about aesthetics – or with huge budgets And don’t even get my started on renovation shows… I can’t watch them. And I LIVE for this stuff. I’ll only watch the UK version of Grand Designs – that’s it! Anyway, for the reno guide, I was pretty much given free reign to write about what I wanted to write about as long as it fitted within their general section guides. And so I did. I wrote 40,000 words on renovating – why you should, where to start, who to contact, what things might cost, how long things might take, things you should or shouldn’t do, how to shop, how to deal with tradies, how to decorate, how to be environmentally savvy, all things about windows, doors, floors, paint, hardware, lights, all the rooms, outside/inside and behind the scenes. I tried to include meaty information like measurements for placement of bathroom and kitchen fittings, who to contact for what job (you don’t always need a builder or architect), what you’ll be out of pocket before you even lift a hammer, and even if going the home builder route is for you. Basically, it was a 101 in renovating. It was something I always wanted to write and something I always wanted to read. Real Living Renovations is out now in newsagents and I do hope it’s helpful! And yet despite a whole magazine dedicated to it, I couldn’t cover everything – and I couldn’t get specific on something that is going to be entirely different one build to the next. And so, as a kind of extension (ha! see what I did there?) on that magazine, I thought I’d outline our own project here – what we’ve gone through, how long things took, what they cost, our problems and solutions, the good, the bad, the ugly! We are going the owner/builder route ourselves and one step further than that: Steve is literally building it! After being over his career for a while (politics/media!!!!! Not surprising! ), he resigned late last year to start a whole new career: carpentery! We’ve often longed for a more relaxed, simple lifestyle – less stress, timeless skills, more time together… We came to that great understanding that earning a lot of money didn’t mean happiness, so we changed our stars. We spoke to the carpenter we planned to use for our build and he was so keen for Steve to work on our house – he was happy to show him the ropes and build up his skills with a view to being accredited down the track via prior learning. In the end, his apprentice left and he offered Steve some work before our place was ready to go, so Steve donned the tools earlier this year and has been his trusty sidekick ever since, starting from scratch in a new career. I’m so proud – and so excited he will have such a huge part in building our extension. Another thing we’ll be doing – and documenting – is paying for everything ourselves. It’s kind of bugged me for a long time now that somewhere along the line, blogs equal freebies – especially in the DIY/home arena. I often can’t look past the fact that someone got something for free and that’s why it is in their house. I can appreciate people earning money from their blog or turning it into their career and I really enjoy a lot of the blogs that do accept freebies – some of my faves manage to work it well. But that side of things is not for me. I’d love to some day, somehow, monetise my blog, but the current model with sponsorships/gifts/freebies etc isn’t for me anymore. I stopped it all a while back and while it’s tempting sometimes to say yes to things that are offered – especially if it really is something I’d probably buy – I don’t feel it’s a true reflection of what renovating/decorating/home-making is about. And I’m all for sharing the real side of things. So if it comes down to real budgets, real compromises are going to be made. And by real I don’t mean hundreds of thousands of dollars and top-end everything. Ours is ballparked at $170k but that is for a huge extension, second storey, laundry, two decks and balcony. I know in parts of Sydney that money might buy you a couple of decks and a bathroom renovation. I also know in other parts of Australia it could buy you a beautiful house. I’m not saying it’s a budget renovation, I’m just saying our money is going to have to work really hard to get what we want. We aren’t taking out a loan or extending our mortgage, it’s our hard-earned money going back into our home with hard physical work (well, Steve’s hard physical work!! ), careful choices and lots of compromises. And because of that – our home is not going to be Pinterest perfect. And it’s not going to be designery, too tricky or trendy. It’ll just be a home that reflects our wants and needs – and that is what everyone’s home should be: a reflection of the people who live there. Not those who live in photoshopped pages of magazines! Because no-one lives in those rooms as they’re portrayed. I KNOW what goes on before a house makes it into a magazine – lots of props (I recall a house having its entire contents replaced for a photoshoot!) rearranging, seeking of good angles, professional photographers and stylists, editing, cropping, photoshopping… Don’t ever feel bad you don’t measure up. All that applies to Instagram images of people’s homes and lives too, by the way! Consider them inspiration and use them to inspire your own spin on it. It’s taken me a while, but that’s what I do now. PS: Speaking about renovations… For a guide to renovating your bathroom, head here. One day I’ll get around to doing a kitchen one too. One day!